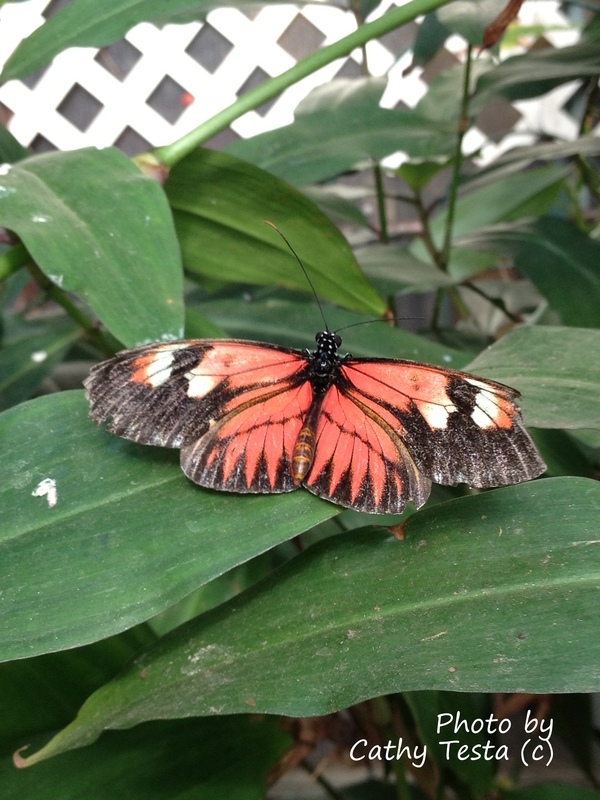 If you suffer from a seasonal disorder in the winter, where you need to get out to break from the winter blues, may I suggest a visit to the “Magic Wings Butterfly Conservatory and Gardens” located on 281 Greenfield Road in South Deerfield, MA? It will be a place of warmth, sunshine, and lots of color. I visited yesterday with my sister and niece, and here are the photos I took along the way. I think this one is my favorite photos of the day. If I am reading the butterfly id chart correctly, which I purchased for $1.00 at the entrance ticket booth, this is a Brown Clipper, Parthenos sylvia. I don’t know much about butterflies other than they are beautiful in the garden – serving as nature’s living art – so hopefully I have the right names written with the photos I took yesterday. Again, not sure but this one looks like Tithorea. Love the long antennae and legs. There are many tropical plants at the conservatory and this one was probably my favorite of the lot. 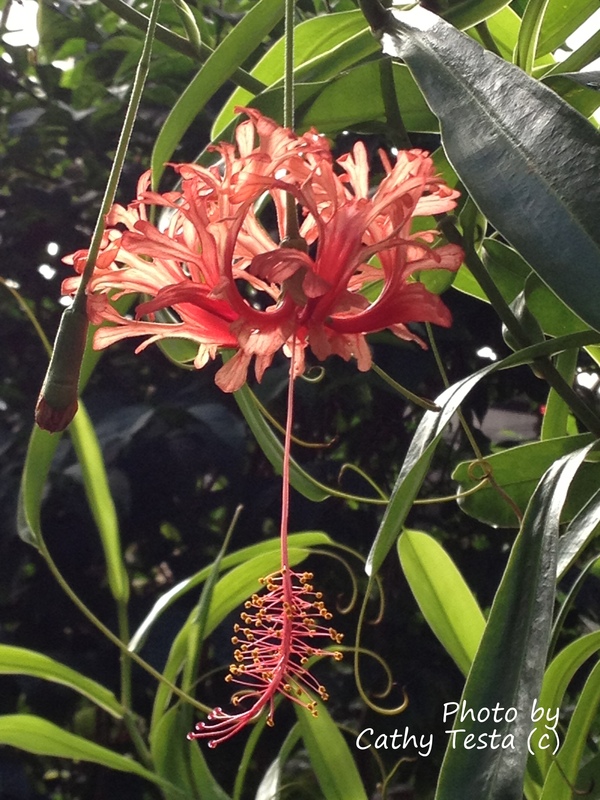 A Hibiscus schizopetalus, Japanese Lantern bloom with a long stamen dripping down in such an elegant fashion. Just love the look of this bloom and the next butterfly photo is a perfect color comparison. 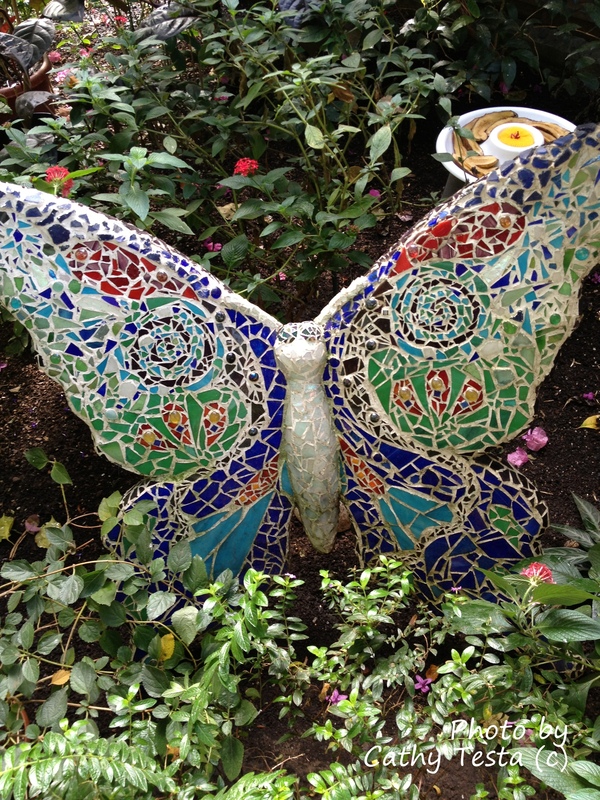 One of the things I noticed was many of the butterflies did have some wing tears, which made me a little sad. 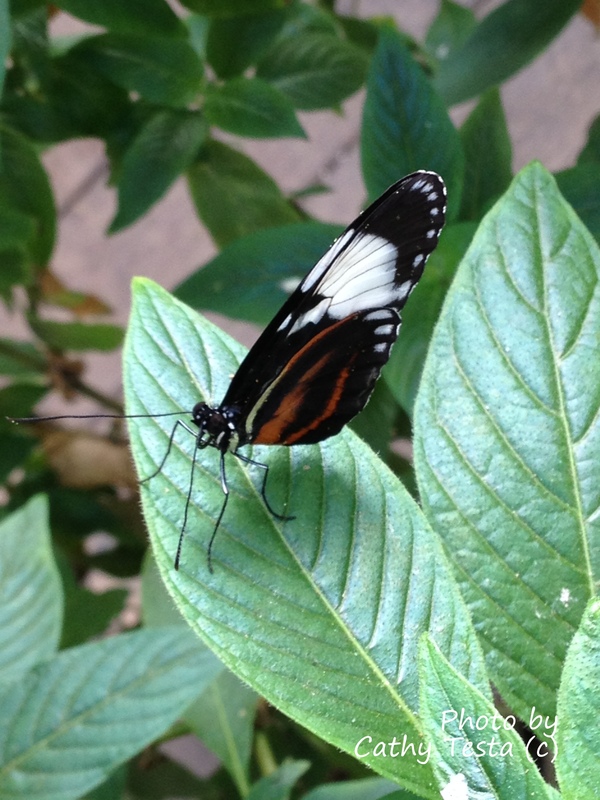 This one is Postman, Heliconius melpomene. He matches the Hibiscus photo above in coloring. 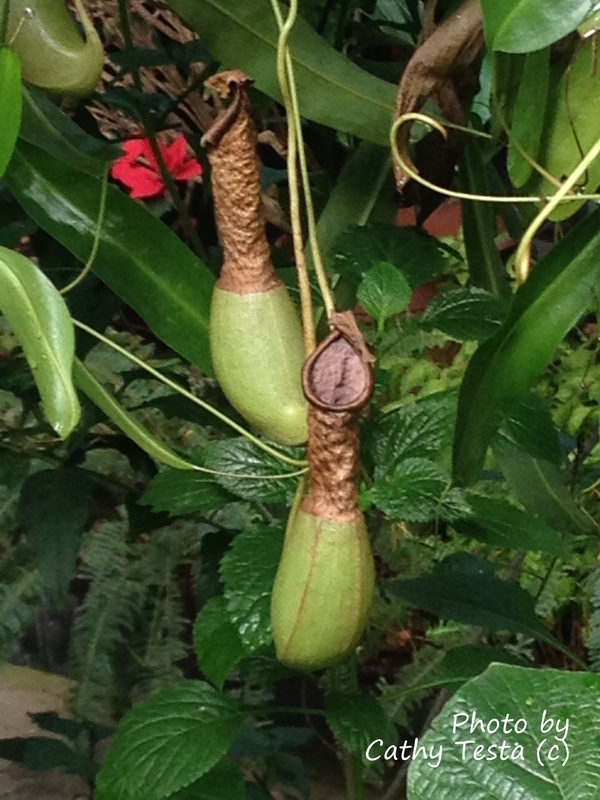 My niece asked me what this plant was, and of course, it is a type of pitcher plant. I didn’t see many plant labels at the conservatory, and it would be nice for them to offer a plant identification key like they offer for the butterflies. These types of plants are found in tropical rain forests, and many know they get their nutrition by capturing insects in their pitcher. I saw a television show recently that also indicated a new discovery of some larger species luring small rodent-like animals, and they go for the nectar while on top of the pitcher, and guess what drops out the animal’s back end into the pitcher? Yup, their poop – another source of energy to the plant. This is a plant I’ve grown in my container gardens. Pachystachys lutea. 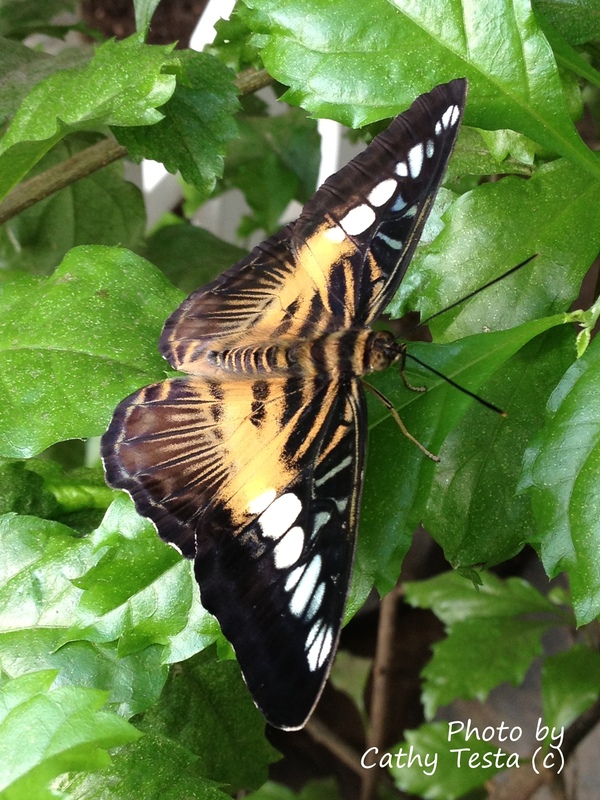 There were many of these at the conservatory for the butterflies to enjoy. 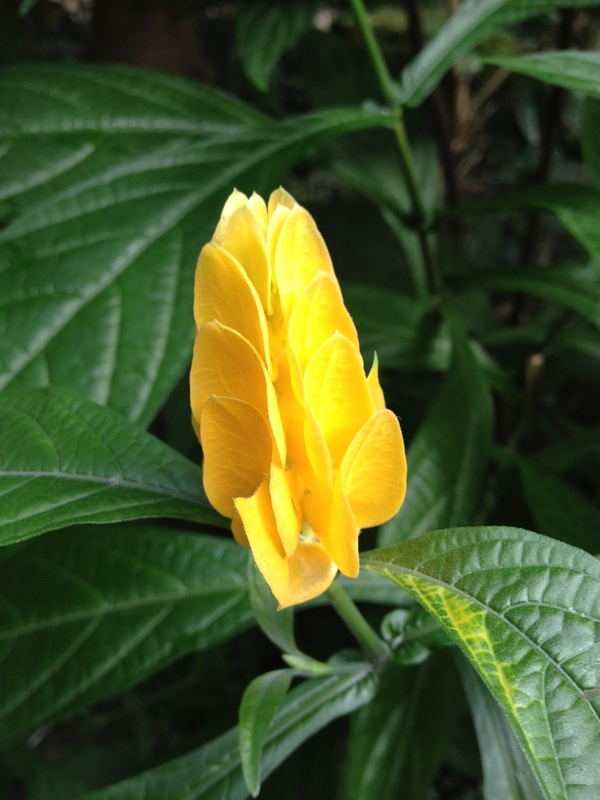 You can see why it is called a golden shrimp plant as the common name. The flowers are not the yellow parts you see here; these are the bracts. The white flowers extend from these, and in my container garden, the hummingbirds loved them. There were a few Justicia plants, the common name for this one is shrimp plant too. It is a broadleaf evergreen shrub, and I adore the style of the flowers. 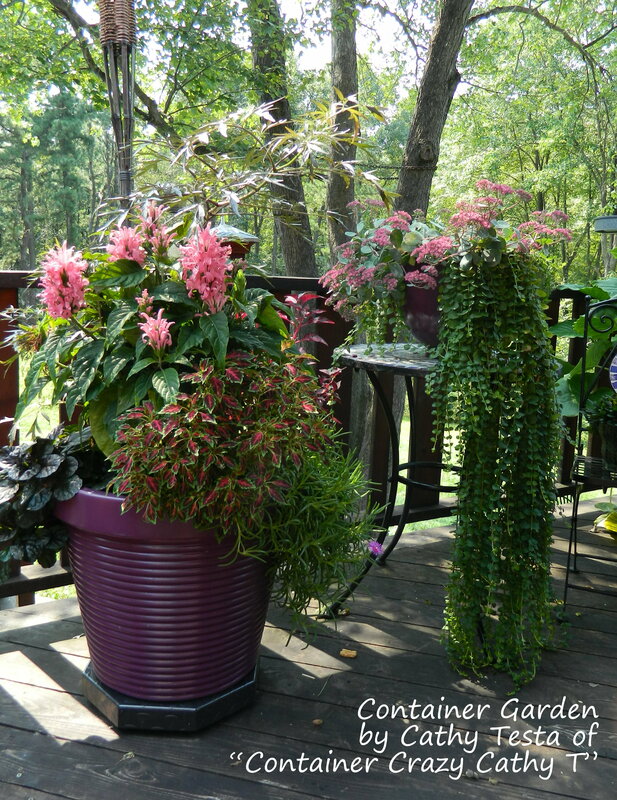 Very exotic, and this one had a deep hot pink color, but the one I used in a container garden was a softer pink – both are spectacular, and loved by hummingbirds and butterflies. This photo was taken of my container garden in early September about two years ago. The large pot is combined with a Coleus, Ajuga, Delosperma, Alternanthera, and Sambucus. The container on the table has a Sedum in it with a Creeping Jenny trailing below. Justicia carnea (shrimp plant) in the large pot bloomed during the summer and into fall, and paired up perfectly with the Sedum blooming around the same time. 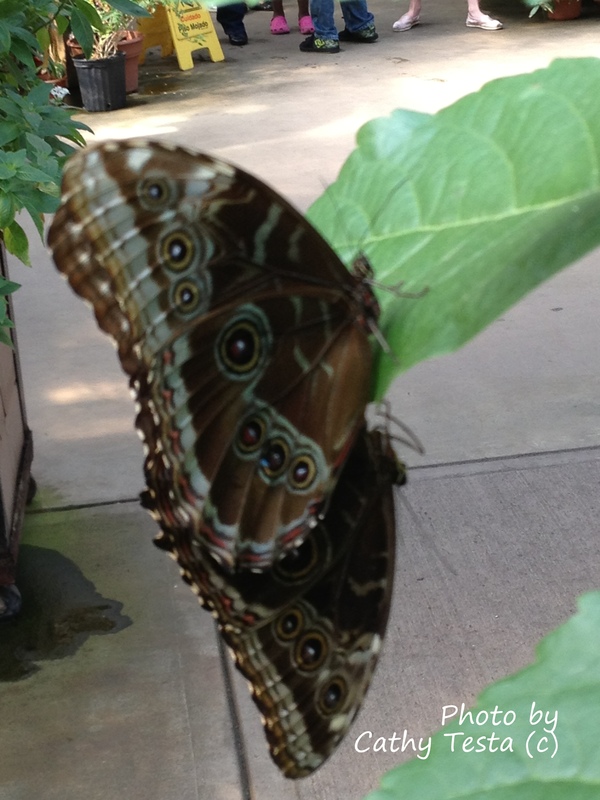 Here’s two owl butterflies, Caligo eurilochus, were having a little mating fun. And it is obvious why they call them “owl” butterflies, used to deter predators. This is the type that landed on my shoulder for quite some time later, see video below. Okay, I know I’ve seen this plant before – but I can’t remember the name? 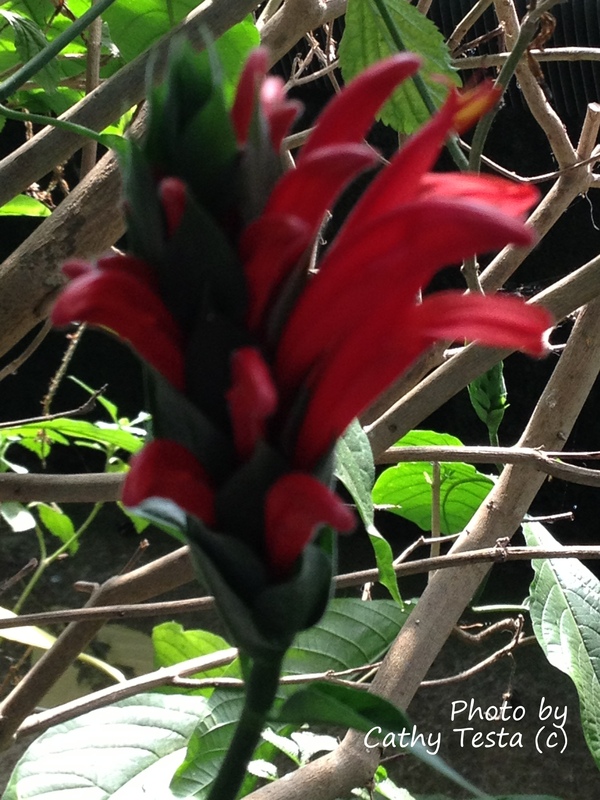 Help me out tropical bloggers – what is this called? 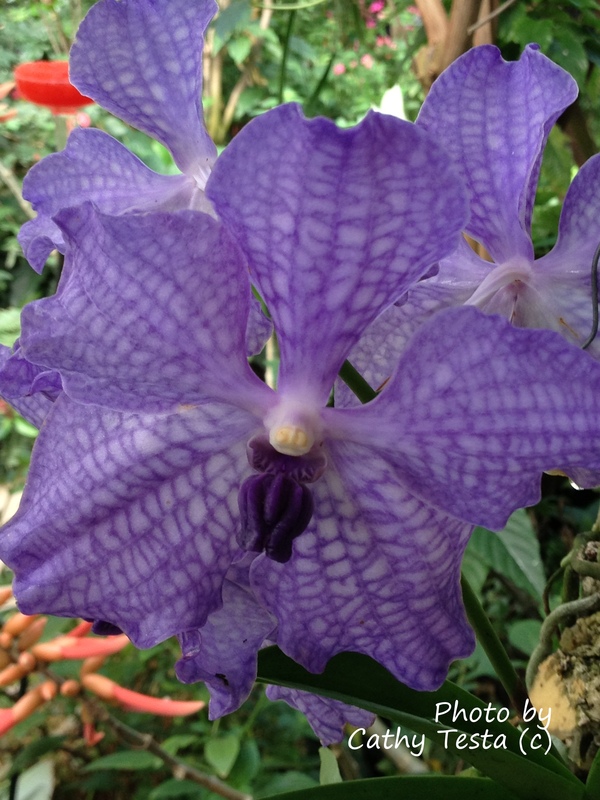 It is so beautiful and the plants at the conservatory trailed all the way up to the ceiling. I would have loved to capture a butterfly on it but no luck. 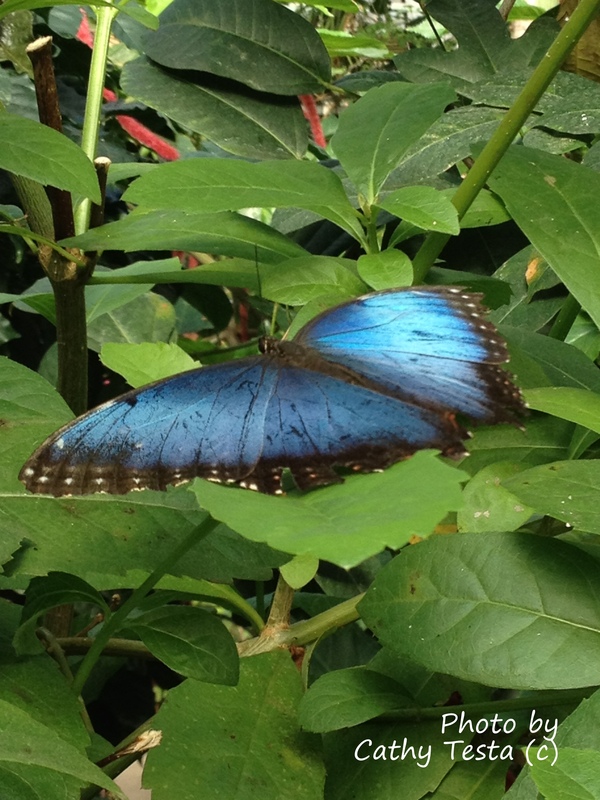 I did have luck capturing this Blue Morpho, Morpho peleides. Got to thank iPhones for the quick clicks. I had to reach up a bit to get the shot, but was so glad he was in a rest state and didn’t fly away. 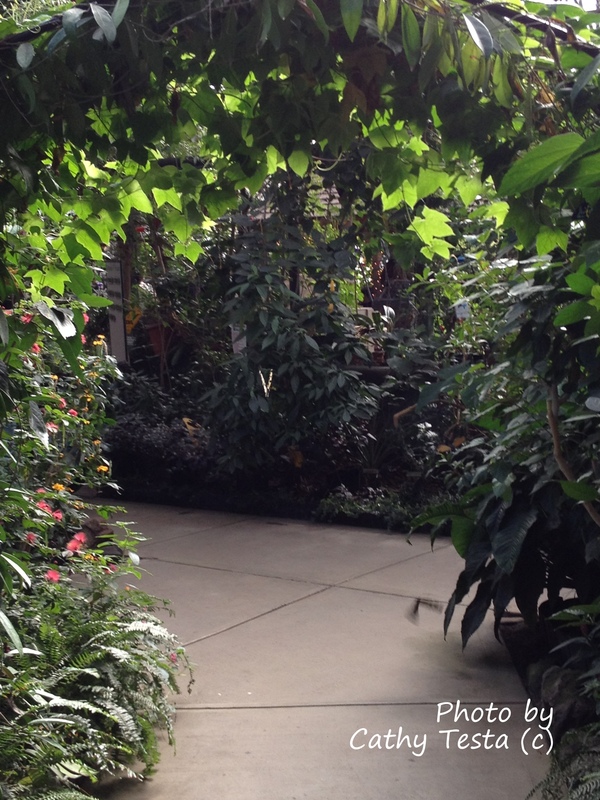 There were mostly tropical plants at the conservatory, which I enjoyed because they are one of my passions – yet, later when I got home, I thought it was sad they didn’t have natives for the butterflies to enjoy – and to showcase. We have many in CT and MA that would suit the feeders. Also, I noticed outside, they had a border along the front of the building enclosed in posts, and it was all old evergreen shrubs, the soil didn’t look too healthy, and I thought, later – when I got home, how wonderful it would be to fill that bed with some native plants. Too bad I don’t work there – LOL. More help please. What is this plant? It looks like a Peregrina bloom? But not sure, the foliage is soft and fuzzy, but the orange flowers are my main attraction. Just a shot of the sculpture in the gardens at the conservatory. 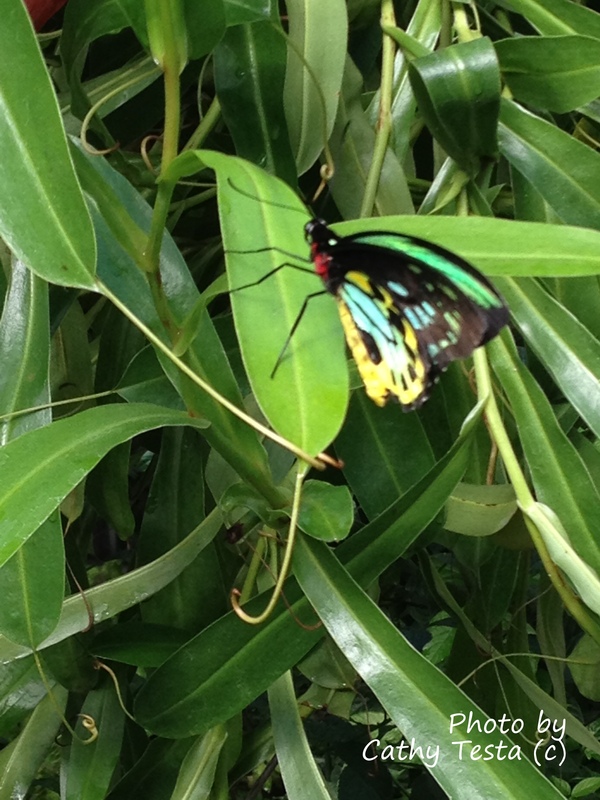 And one more butterfly shot to share, this one is Cairns Birdwing (male), I think. Love the florescent coloring. Recommendation: If you happen to be visiting MA or CT, this is a fun trip with kids, or if you are into photography. There is food sold at the sight, but I enjoyed the restaurant at Yankee Candle right down the road. Go early, as if it is school vacation season, it will get busy quickly. Special Occasion: If you have an engagement to announce, this could be a great place to go with a photographer for some fun shots, but be prepared to get hot – it is humid and warm in the conservatory. Wear light clothing. Location: 281 Greenfield Rd. (Rt 5 & 10) off of 91. If traveling north, take the exit 24 noted for Yankee Candle. If traveling south, take Exit 25. South Deerfield, MA. Hours: Per their pamphlet, they are open year round 7 days a week. Summer: 9 am to 6 pm. Fall/Winter/Spring: 9 am to 5 pm. Closed on some holidays. Butterfly Key: I recommend you pay the $1 for the key, my niece immediately wanted to use it as we strolled along. She had a big desire to identify all the butterflies. I wish they had a key for the plants, but I don’t think they did – or perhaps I missed it somehow. Camera: Bring your camera of course. And last but not least, when you enter the exhibit, you first enter a room of insects in tanks. They reminded me of “Indiana Jones” bugs, large and yucky. 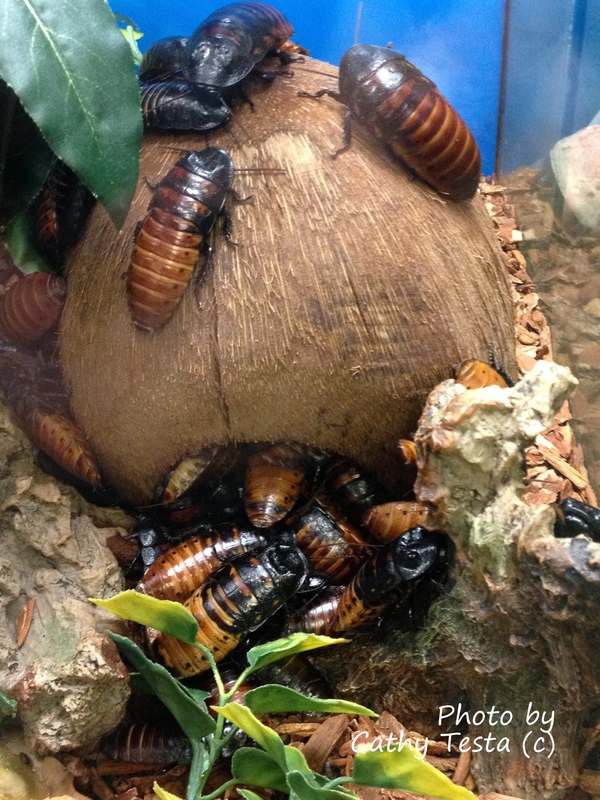 And to finish off this informal quick post, here’s a photo of “Hissing Cockroaches”….Yuck. But fun still for the kids! 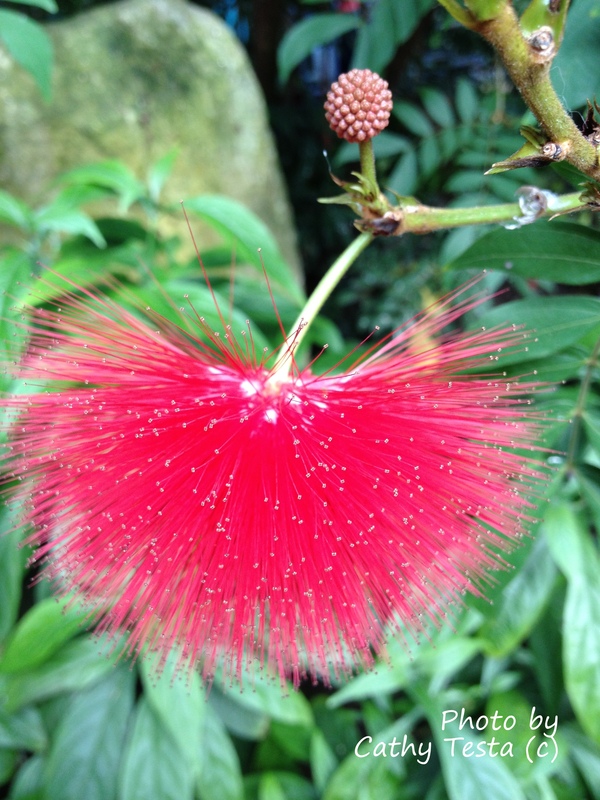 The un-named plant is a Powder Puff plant. 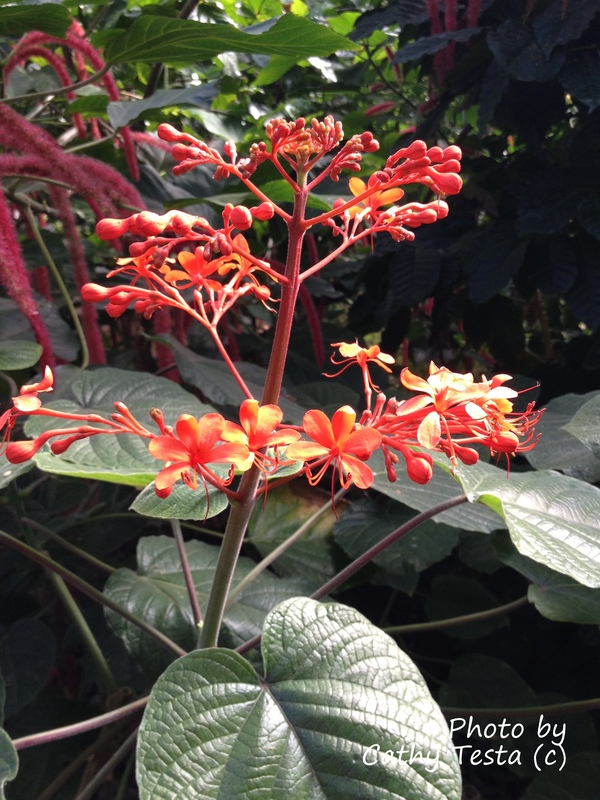 Butterflies and hummingbirds love this plant. The flowers unfurl like a fern, the dots on the tips are yellow pollen balls. The leaves fold together flat at night and then spread wide open again every morning. I’ve had one as a houseplant for over 25 years and it has always been one of my favorites. p/s sry for the wrong comment on the other post….